In a small bowl, mix the 1/2 flax egg. Set aside. In a medium sized bowl cream the sugar, vegan margarine, and vanilla until incorporated. Add in the flax egg and beat for about 60 seconds. In another bowl, whisk the dry ingredients together (cream of tartar, baking soda, flour, and pinch of cinnamon). Add the dry mixture to the wet mixture and stir well. Use your hands to knead together the dough. Shape the dough into a ball and wrap it in plastic wrap. Place in the fridge for 1 hour. After 1 hour, preheat the oven to 375F and take about 1.5 tbsp of dough and shape into a ball. Roll in cinnamon sugar and then press the ball with a fork to flatten slightly. Repeat 9 more times to make 10 cookies. Bake for 10-12 minutes. 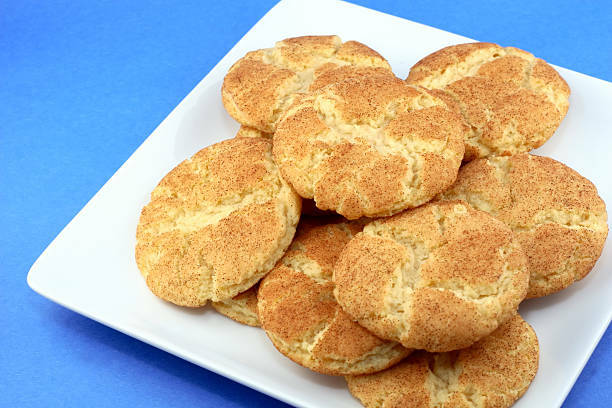 (If you want chewy cookies bake for 10 minutes and if you want crispy cookies bake for 12 minutes.) Cool for about 10 minutes.